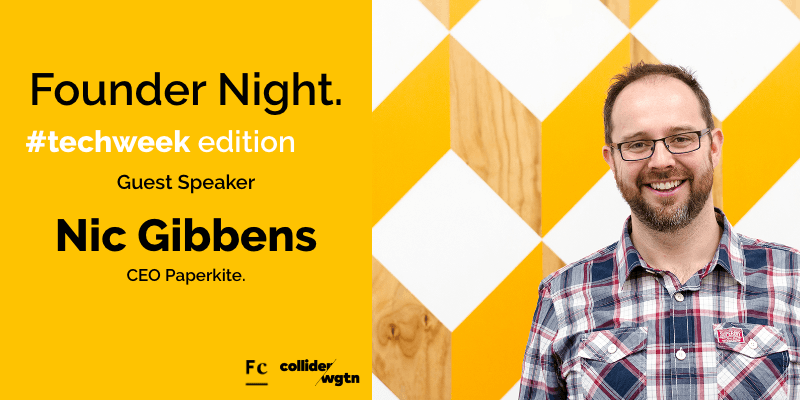 After the successful debut last year, we're excited to announce the return of 'Founders Nights', to the Collider events programme! Founders Nights are a great opportunity to gain honest insights from an inspiring founder and connect with other entrepreneurs in the room. Even more exciting than this is the announcement of our TechWeek special edition Founders Night with PaperKite's founder, Nic Gibbens. Nic founded PaperKite in 2010 and has gone from running the company in its first year on close to no income to multi-million dollar business today. PaperKite has built some of New Zealand's most successful apps with heavy hitting clients such as Air New Zealand, BP, NZ Rugby, Coca-cola, and MetService just to name a few. Also, for any beer lovers out there, you would have experienced their world class ingenuity first hand if you attended Beervana and downloaded the interactive app. Nic will be giving frank and open insights on what it has been like to build the PaperKite brand and the 22 strong team who come to PaperKite each day to work their magic. Nic's talk will conclude with a super informal fire-side chat with BizDojo Co-founder, Jonah Merchant. This is a great opportunity to ask Nic any burning questions you might have. As well as fulfilling his CEO duties, Nic works closely with the executive teams of many of PaperKite’s clients to ensure that mobile strategy and stewardship are key areas of focus for their businesses moving forwards.